Despite being a new name on the Clyde when she arrived this morning, the profile of X-PRESS MATTERHORN is a familiar one, as she is a sistership of two vessels seen on the river in the past. This vessel was, until a week ago, named ENFORCER, and is one of the six sisters belonging to JR Shipping BV, a class which includes ENCOUNTER and ENDEAVOR. The 750-TEU ship was completed at the very end of 2003 by the Dutch builder Volharding at their Hoogezand yard. X-PRESS MATTERHORN is on charter to OOCL for their SIX service, and has replaced X-PRESS ELBRUS on the weekly Southampton-Dublin-Greenock-Belfast service. 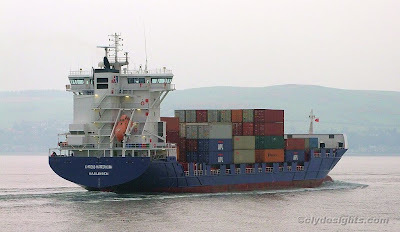 Another member of the class, X-PRESS MONTE BIANCO, which was originally named ENSEMBLE, is due to arrive tonight on another SIX service from Dublin and Rotterdam. Both vessels are currently scheduled to visit the Clyde regularly over the next few weeks.